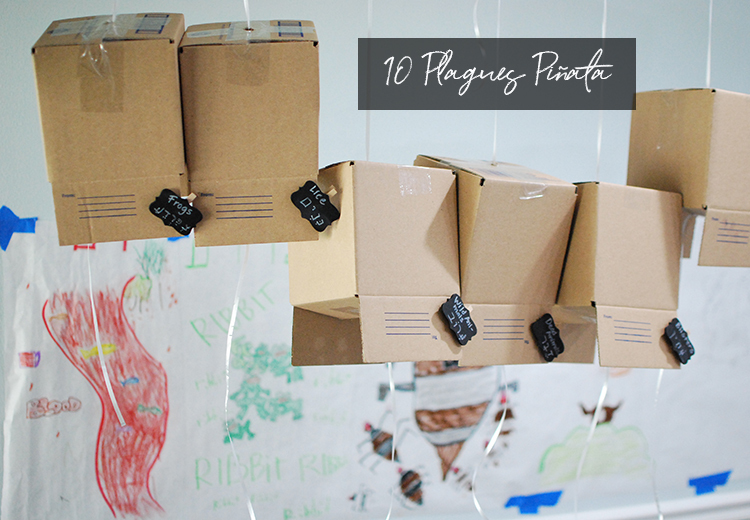 I feel like this post should be titled, “How to wake up your guests during the Seder.” Enter the 10 Plagues Piñata. Might not look too “Pinterest worthy,” but boy was it fun! And yes, I envisioned something totally beautiful and fancy, but you know what… done is better than perfect! So take that Pinterest! #letskeepitreal Please welcome my super home made 10 Plagues Piñata! If you’ve been reading for a while, you know we try to make our Seders fun and engaging and involve the children as well as the adults. (You can read here about how we get our kids involved.) Past years’ fun Passover decor included the 10 Plagues Centerpiece, the Murals, and this Passover Table Decor. I think this year topped it off! The Murals came back up and in lieu of the Centerpiece, which had graced our Seder table for a few years, we opted for plagues that would fall over our heads at the Passover Seder! Can you spy my kitchen covered in the background? We take Passover very seriously around here! Topic for another blog post. As I said, I figured the kids and I would make something super cool and creative (read: beautiful and Pinterest-worthy) but come on… I had limited time and my goal is not to be famous on Pinterest but to keep my kids engaged and excited about their Jewish heritage, observances and traditions. (Remember my Five Practical Passover Tips here?) So my dreams of something pinnable were truncated by my dreams of having happily engaged children. And I’m so glad because the children enjoyed every minute of this, from conceiving the idea, to making it, to its execution at the Seder table! We had said we wanted to make piñatas, but weren’t sure how. We found these boxes at Walmart and said, “this is it!” (you can’t beat the 57 cent cost of the box) Then, we went shopping for whatever items we were missing (we had a lot already from the Passover Centerpiece). The kids then assembled and filled each box with each plague. Now, according to my son and husband, it took some engineerical ingenuity to make these hang, but hang they did. And when we pulled the strings during the Seder … Makot fell down! And here is what we used, or something similar, in case you want to get inspired for next year. Blood: red shredded paper (which you can pick up at the dollar store). Yeah, we had a huge mess of shredded paper, bugs, animals, foam balls, etc. everywhere, but it was a ton of fun!!! So, I invite you to take this idea and make it your own for next year and show me what you came up with. Tomorrow, the party starts again! (No piñatas, but it is a two day Holiday again!) So, don’t forget candle lighting for Thursday and Friday! Check your local calendar for times. Wishing you a Chag Kasher V’Sameach! I’d also like to remind you that Professional Organizer, Rebekah Saltzman, who was on Jewish Latin Princess Episode 27 is launching Conquer Your Clutter, a 10 week organization challenge on April 15, 2018. If you want to see if this course is for you, you can take this super quick quiz. The course is so awesome and Rebekah is so confident about the results you’ll see when you embark on this process with her, that she will be giving you $30 back for every challenge you complete. Yes, that’s $300 back! Oh and the other great part, just for being my reader and podcast listener, YOU get $100 off the purchase prize with the code JLP100 at checkout. I’m so excited to bring you this offer as an affiliate to Rebekah’s course, because I love her work and I’m all for getting our lives more organized and simplified. And Rebekah has taught me just that! Yeah, as much as I brag about being organized, I admit to have room for improvement in this area… hmmm tons of room for improvement!!! So, check out the course here, take your quiz here and don’t forget to use the code JLP 100 at checkout.